- Your opponents most expensive unit/Character has fled the battle field or been removed as a casualty. An interesting twist but not exactly something I could use to great advantage since I don't have many ranks. Also, killing the most expensive unit and/or character might be quite a problem sometimes. Reading these rules I got a feeling it helps cheap horde regiments and deathstars as in my opinion bonus points were easier to grab with these. Ah well, I guess I had to simply fight for the win no matter what are the bonuses. Although in the hindsight I should pay more attention to these as I can either prevent the enemy from getting them or grab some extra points myself. It would also give me some hints as to where the enemy might move his units. 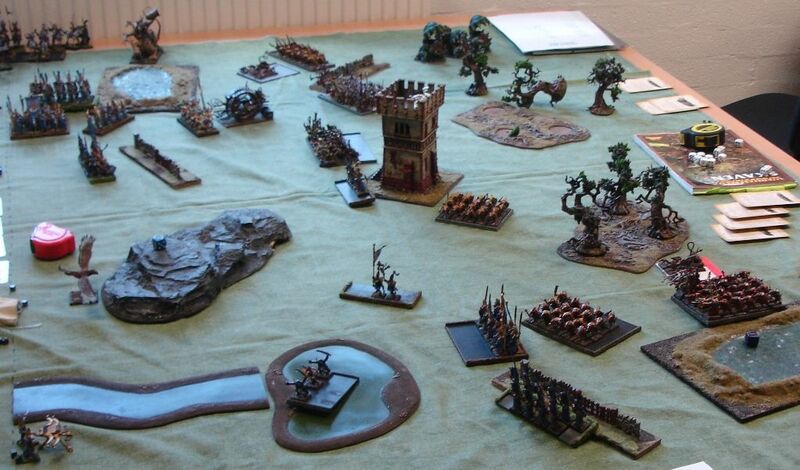 I had a great pleasure to meet and play against Sean and his sneaky Skaven. Ratmen are always a difficult enemy with their crazy rules and units. Sean brought an army that was a very interesting mixture of usual suspects with units that might not appear often in that particular configuration. As you can see quite a dangerous mixture. I know Queek already and he and his stormvermin are very dangerous. Storm banner meant trouble for shooting and also would ground eagles. 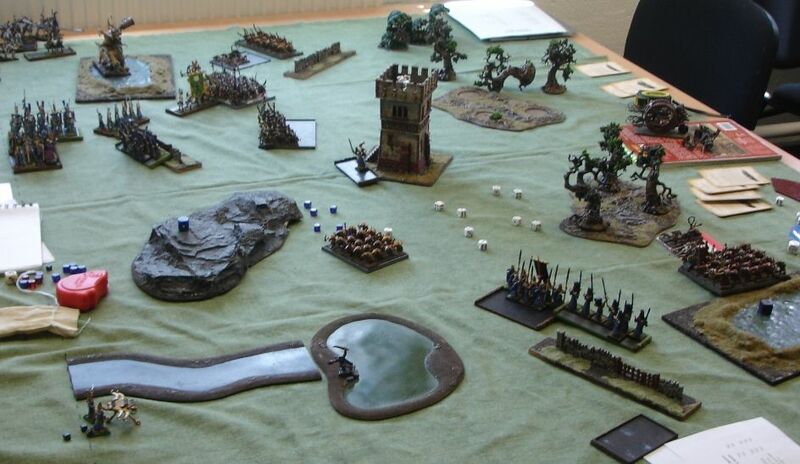 Skaven magic is always dangerous so I was expecting hard time deciding what to let through and what to dispel. On top of that A-bom as well as D-wheel could wreck havoc on their own so containing these threats somehow would be a challenge. Scenario rules definitely benefited Skaven as they had a lot of units with ranks while at the same time could easily kill a few elves to deny me that bonus. However, the biggest factor in that game had to be the deployment and the rolls for it. 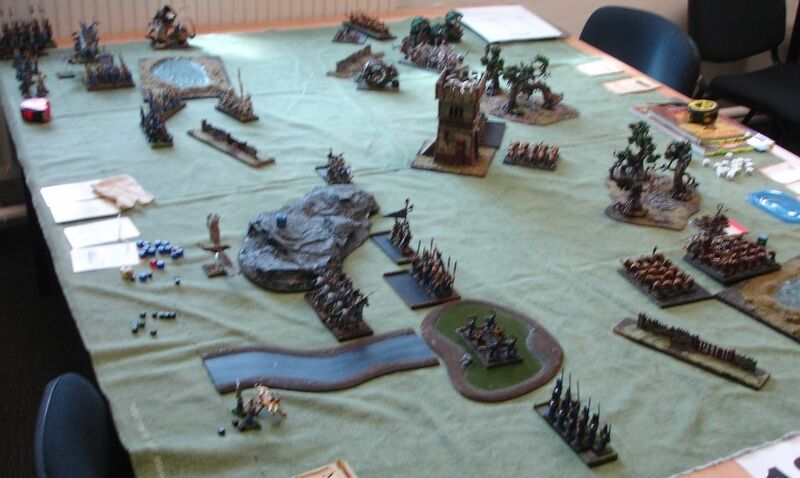 As it happened it was me who won the first roll-off so I picked the side and started deploying the army. 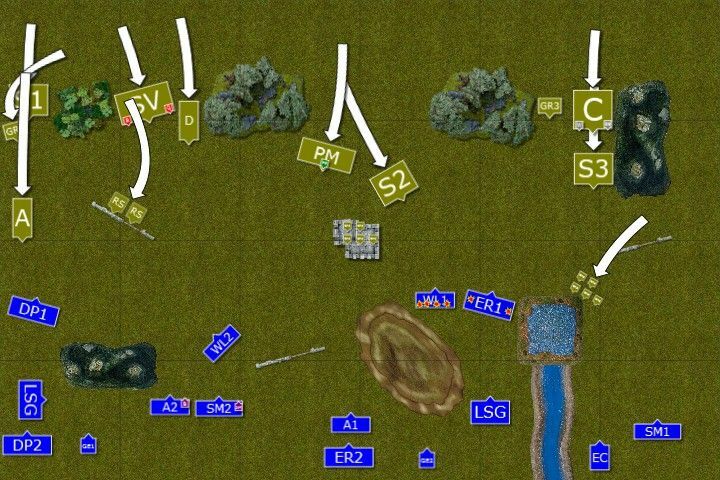 Both units of heavy cavalry and one sea guard as well as one eagle had to deploy on the left flank. Swordmasters and Eagle Claw ended up on the right flank and the rest of the army had to deploy in the middle. 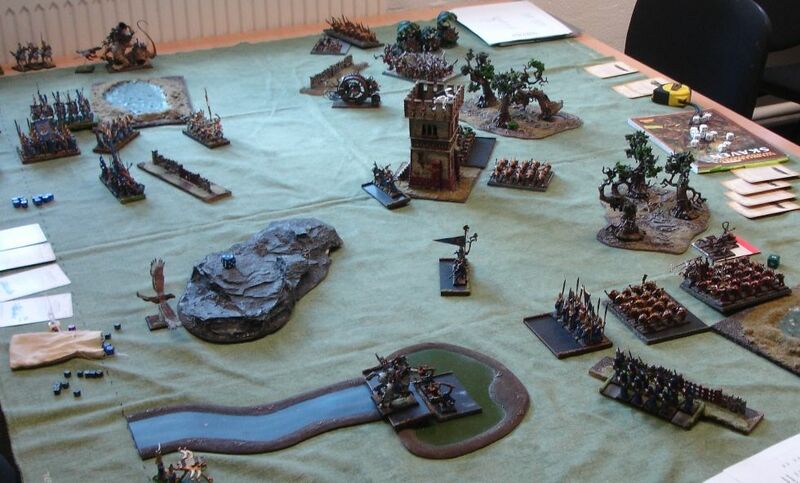 Skaven had their own problems with many units deploying on a single flank with little space to fit in. Their army arrived in 3 groups. Terrain was quite interesting. The mazes were a "no-go" places, in particular for the heavy cavalry. The tower seemed like a perfect place for the gutter runners to hide and river and forests were also a surprise factor. On the other hand the battle field looked relatively empty and clear for maneuvers. Grey Seer and Warlock were leading clanrats. Queek and BSB joined Stormvermin and Priest was obviously with plague monks. Archmage joined Swordmasters and BSB started with Archers. Skaven tried to steal the initiative but failed and Elves had first turn. 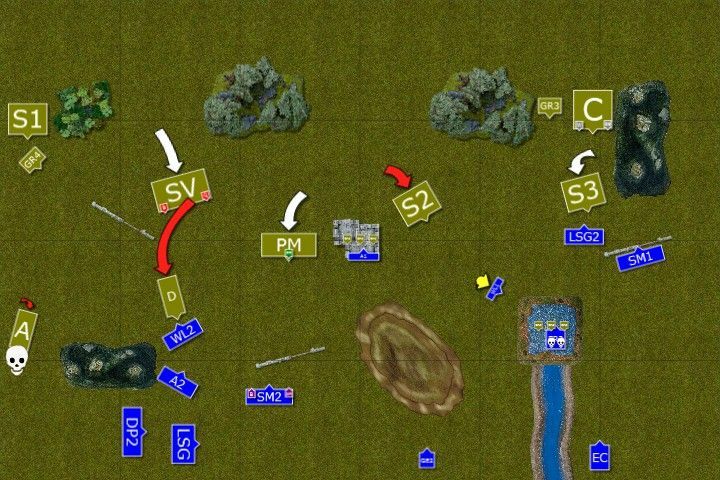 Regiments on the left flank tried to advance through narrow corridor but at the last moment sea guard decided to reform and move towards the center. That maneuver was not performed with proper timing and the knights behind them were blocked. 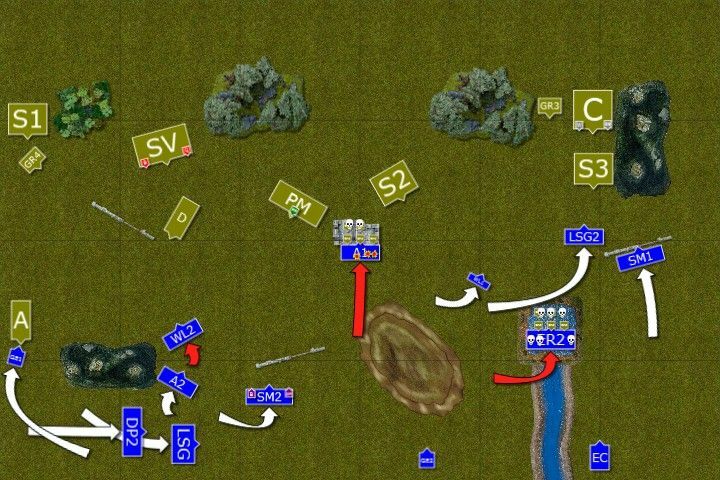 On the right flank some units moved towards the enemy while the rest waited in anticipation. Shooting at gutter runners proved to be inefficient as sneaky rats hid well. The rats on the left flank move forward at a double, the advance spearheaded by ever hungry abomination. Plague Monks wheeled towards the left flank too. Only grey seer advanced a little more cautiously, only to get into the range for some of the spells. As soon as they did it lightnings cracked the air and lions died. Gutter runners aimed at reavers (Edit: And I think at eagle claw too) and some of the light horse fell to the ground. Dragon Princes decided on a bold move. They charged rat swarms believing they can kill them fast enough and use the momentum to carry them further and catch the doom wheel unaware. Unfortunately pesky rats were not that easy to catch and the knights were in a serious danger. On the right flank reavers tried their chances against gutter runners but the assassin adepts were good at dodging the attacks and killed reckless elves for their trouble. Giant rats were released and Dragon Princes tried to use the opportunity to withdraw but the engineer operating the wheel caught them all before they escaped. Abomination moved happily forward and was very close to elven units now. 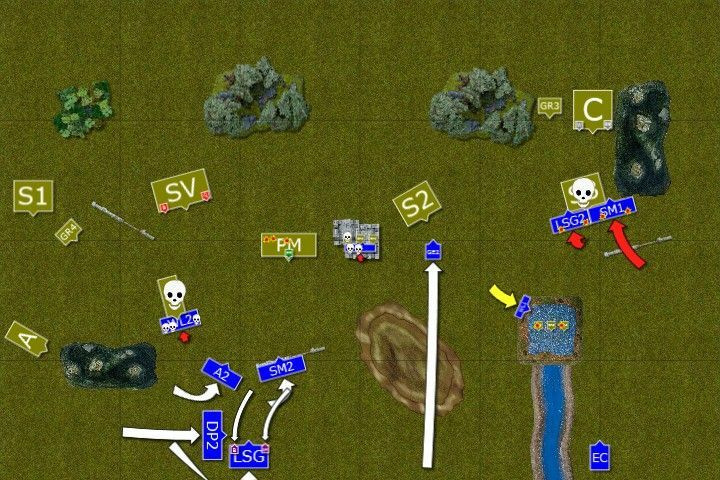 On the right flank the advance was stalled to allow magic and shooting to do the damage. Many elven units suffered this time but it could be worse. Fortunately for the Elves the nasty plague was not strong enough to affect many units at the same time. But the damage was done anyway. The regiments on the left try to escape the Abomination with an eagle nobly sacrificing for the greater good. Lions try but fail to intercept the doom wheel. Now they seem to be its next target. 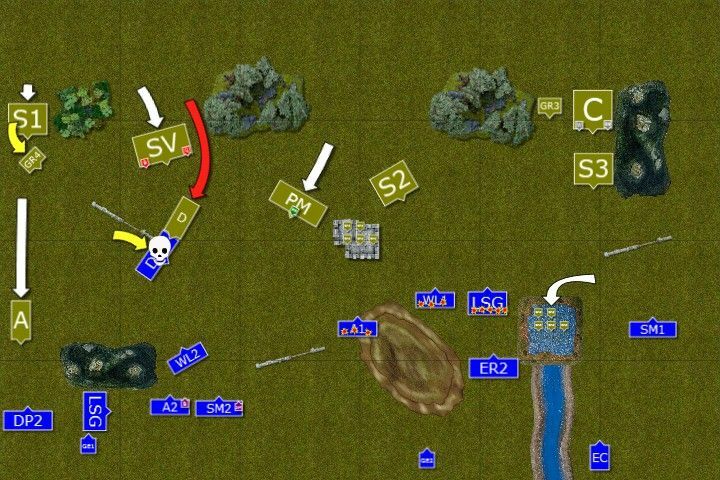 In the center Archers decided they are more useful in close combat and charged the tower but after vicious combat were pushed back. On the right flank another unit of reavers charged gutter runners and although this time elves won the combat pesky rats refused to flee. As expected Abomination took the bait and attacked the eagle. Great bird of prey had no chance in that combat. Warlock engineer eagerly pushed buttons to move his infernal machine further. But something happened in the middle of the way and he started to lose momentum. It seemed that rats stopped running. The engineer cursed when he noticed that the cheese-meter stopped providing the encouragement pieces to the rats. Fool-fool slaves! Told-squeaked that he needed a pipe with bigger diameter! Now the cheeses is stuck and rats stopped running! The doom wheel stopped not so far away from the small regiment of lion cloaked elves. To his horror, the engineer finally noticed the huge axes the elves were wielding and they just begun to run towards his machine! Fool-fool slaves! White Lions took the opportunity and destroyed the doom wheel on the charge. Archers charged again as well and again were pushed back by gutter runners. Shooting killed all but 1 gutter runner from the second pack but lone rat didn't flee. Probably decided it is even better opportunity for career development if he is the only survivor. Sea guard ans Swordmasters destroy slaves but running rats kill a few of them too. Nom-nom-nom! A-bom rampaging through the swamp? Hell yeah! In a final act of the battle Skaven consolidate their positions and destroy some regiments which took casualties earlier. 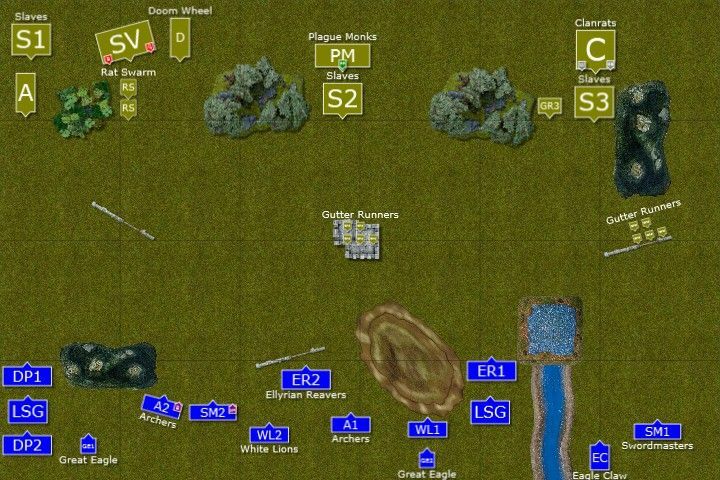 The morning fog magically re-appeared and both armies limped away to regroup. Game 2 was another one where we had to stop before we played it to the end. In fact we lacked time to finish the combat between Stormvermin and White Lions. I think Lions would survive to take their stubborn test but then it did happen that they failed it even with a re-roll. That might also caused a chain reaction of panic tests. Because of that I wanted to apologize to Sean but it was absolutely not intentional. I must admit that my indecisiveness and lack of coherence in the deployment and movement cost me the game. I was very lucky to lose only 9-11. I should have been punished more. While it is tricky to deploy well with dawn attack I made some mistakes here. First, column of Dragon Princes and sea guard was just asking for trouble. Too far away from the BSB and in an awkward position meant they could not move well. I should have positioned sea guard closer to the flank and use the marsh as a defense. Then heavy cavalry would be free to move. The units in the center also were not positioned well as they didn't support each other. 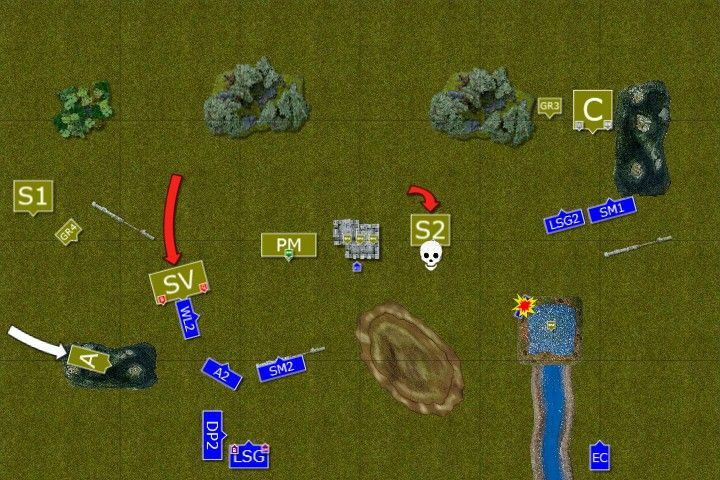 I should have deployed a little further but more centrally and use that as a good starting point to move to either flank. 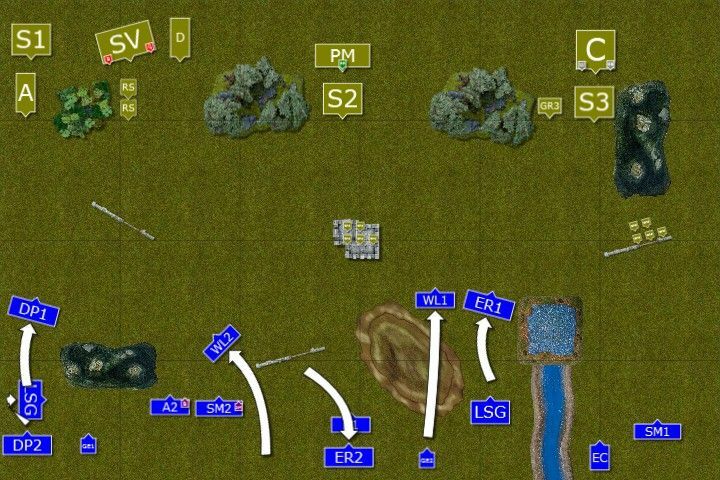 I totally missed the opportunity to get some points from the enemy due to the separation between the regiments. Even with my poor deployment I could move both light cavalry, sea guard, lions and swordmasters at a double towards the grey seer regiment. I had a chance to isolate him and maybe even destroy his regiment eventually. My concern was that I would be shot at and I didn't want the spells to be cast at these units. However, it happened anyway. I was a little unlucky with combats against the gutter runners as I thought that with re-rolls I should be able to kill them faster but their 2 attacks per model and poisoned attacks were the bane of might lightly armored units. I was very unhappy with my performance in this game. Fortunately for me, Sean was a great sport and we had a great time with a game where a lot of confusion in the deployment phase affected the course of battle. Thanks Sean, it was pleasure to meet you! Hopefully we will have a proper, 6-turn rematch were I will be in a better form too to provide you with a proper challenge! Thanks for the report, Swordmaster! Having both Dragon princes locked up on the left flank was the killer in my book. When your fastest and hardest hitting hammers are restricted to the same small section of the board, it will be an uphill battle. In my estimation, all of his heavy hitters were on the left flank. Seems like a full assault on the weaker eastern flank would be the best bet. Maybe attempt to slow the west flank through stupidity tests from final transmutation and redirectors. Once the east flank is taken care of, see what you can do against Queek and the SV which would be tough however you look at it. Still that plan would require at least one unit of DPs to clear out the east quickly. Also, seems like you had more trouble than you should have with the gutter runners. Just bad luck in that regard. I think considering the deployment issues and a tough list in a scenario that benefited your opponent (ranks giving more VP), you did quite well! Would have loved to seen the game after turn 6. Seems like it could have swung either way. Anxiously awaiting your next report! I've been reading though some of your older reports the past few nights, they are helping me a great deal. Thanks a lot for more great comments! I greatly enjoy them so thanks for the steady stream of them coming! I like the scenarios regardless of the mess they introduce sometimes. They might be corrected or modified but additional objectives are good to have. It also puts a demand on the player to come up with solutions on the spot. I think I haven't done that well enough this game and didn't adapt to the circumstances. 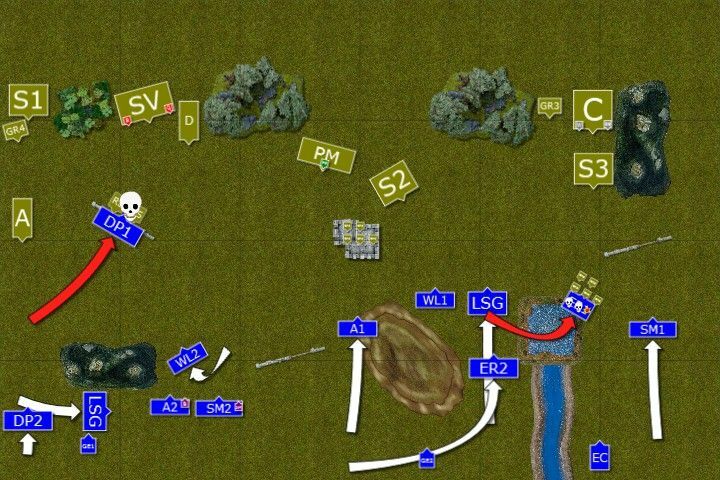 Sure, having the cavalry on a single flank was bad but I should have taken that into account and didn't put LSG in a way they could not move away without swift reforming. Or even in the way of DP at all! They had a good defensive position behind the swamp already. It is indeed a pity we played slow and got only 4 turns. There is a chance I could have gotten his Grey Seer but my left flank was under very high pressure too! Thanks again and keep your comments coming! I will do my best to provide more reports soon!